Rob Atwill, Director of the Western Institute of Food Safety and Security (WIFSS) and Professor of Medical Ecology and Epidemiology, presented on Preventative Interventions to Reduce Dairy Worker Infection Monday, June 6, as part of a series of monthly seminars hosted by the Western Center for Agricultural Health and Safety (WCAHS). 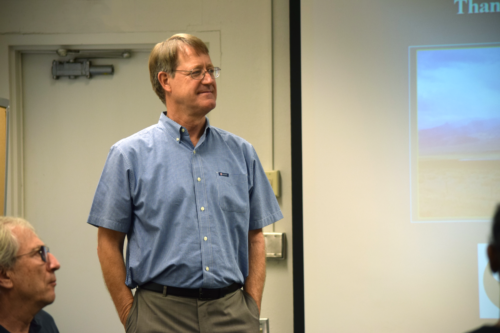 Atwill addressed a combination of veterinary and medical school students and faculty, as well as industry professionals, on the potential risks and remedies associated with Cryptosporidium on dairies. Cryptosporidium parvum is a parasite commonly found in the feces of young dairy calves and other mammalian species like rodents. While it typically causes symptoms such as diarrhea and dehydration in more severe cases, it is also zoonotic, meaning it can infect humans. Atwill’s talk detailed the methods of transmission, best practices for preventing infection in cattle and humans, and the health risks associated with Cryptosporidium for both dairy producers and their workers. Atwill’s seminar at the WCAHS at UC Davis was part of a larger ongoing research project that focuses on dairy worker heath. 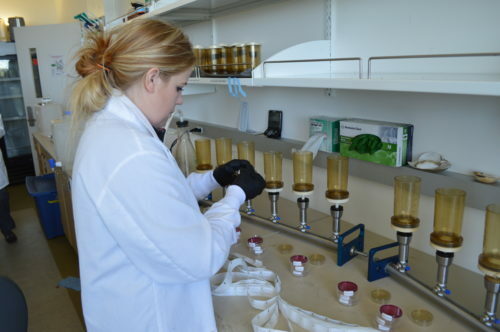 The project, titled “Reducing Occupational Exposure to Zoonotic Pathogens in California Dairy Farm Workers” is being led by a PhD student and laboratory manager of the Atwill Water and Foodborne Zoonotic Disease Laboratory, Jennifer Chase. This four-year project aims to fill the gaps in occupational health and safety for zoonotic disease in California dairy farms, by quantifying microbial risk and evaluating worker behavior and employer controls. Cryptosporidium isn’t the only pathogen under study. The project plans on quantifying four more significant pathogens: Campylobacter spp., Escherichia coli O157:H7, Listeria monocytogenes, and Salmonella. These pathogens are known causative agents of foodborne outbreaks in human and can be endemic in dairy cattle populations. Chase also plans on surveying the specific roles and responsibilities of dairy workers, to estimate the frequency of contact and areas of interaction with cattle that may be infected with zoonotic pathogens. The last year of the study aims to use the results to create outreach materials in the form of voluntary training manuals and recommendations that dairy producers can incorporate into their on-farm safety programs. Awareness of these zoonotic pathogens has the potential to reduce negative health impacts resulting from exposure. “Hopefully we can inform better worker safety practices on the farm so that owners can implement training on their own terms,” Chase commented, citing some of the benefits of her study. The outreach and training efforts of this study could help create a safer dairy environment with less sick days being used by a healthier, more efficient workforce. In turn these positive effects would be systemic, creating an overall awareness for science-based practices that would put both dairy producers and consumers at ease. Chase chose this study to be her doctoral thesis due to its unique focus on human health within an agricultural system. She pursued medical school as an undergraduate, but she realized her passion for research upon taking a class on medical microbiology. As evidenced by the attendance of Atwill’s lecture, this study’s emphasis on human health has attracted a wide range of not only veterinarian specialists, but also occupational health professionals in the medical field. The multidisciplinary approach to this study involves researchers from the UC Davis Vet Med Extension, WCAHS, as well as WIFSS. Mike Payne, dairy outreach coordinator, at WIFSS, and the director of the California Dairy Quality Assurance Program, is also being consulted for his perspective as a specialist in veterinary medicine and toxicology.